Have you ever had one of those moments where you feel everything around you is surreal? You think there’s no way this could be happening? This past summer our family of four went on a 5.5 week road trip. 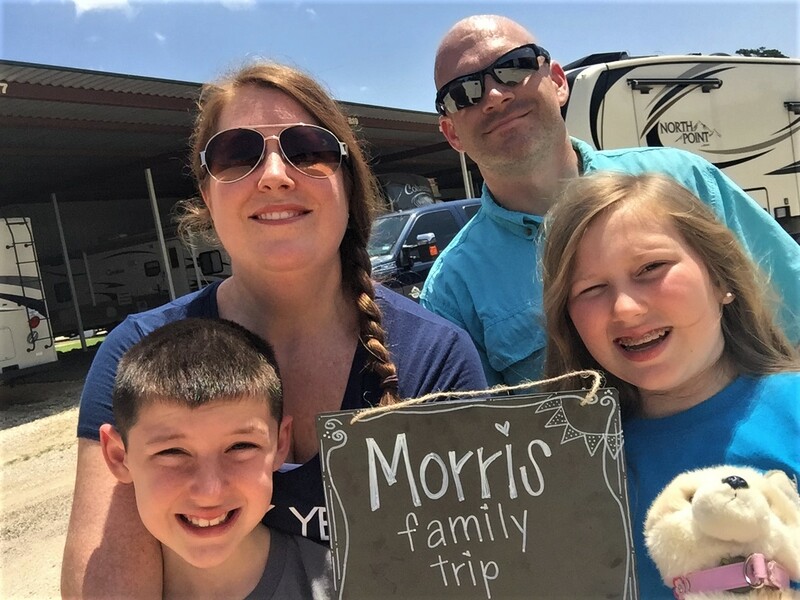 It was our first extended RV trip and we scrimped and saved for a year to afford it. I spent hours and hours on Pinterest looking for blogs to read on the places we were visiting. I wanted everything to be perfect, knowing full well there was no way that could ever happen, but we sure came close!  I can still remember the feelings I had when we pulled out on the road for the very first time.There was so much excitement, mixed with a little fear of the unknown and a lot of satisfaction! In that moment, we could look back on the past year of planning, saving and dreaming and say, “We did it! This is really happening!” On the agenda were 5 U.S. National Parks, 2 Canadian National Parks, 3 Texas State Parks and several stops in between. We could still only dream of what we would see and what we would do, but we were on our way! We had so many “moments” along the way. There was that moment we set out on our very first hike alone in bear country on a trail in Yellowstone. For a family that does not live in bear country, this was more than a little nerve wracking. 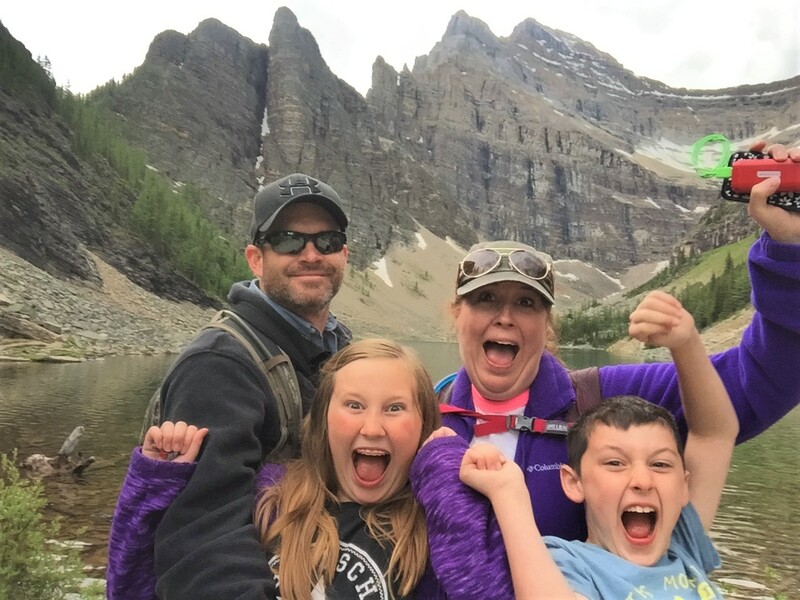 We checked…and double checked…to make sure we had our bear spray and the kids had their bear bells. (Santa sure was nice to bring them these in their stockings!) 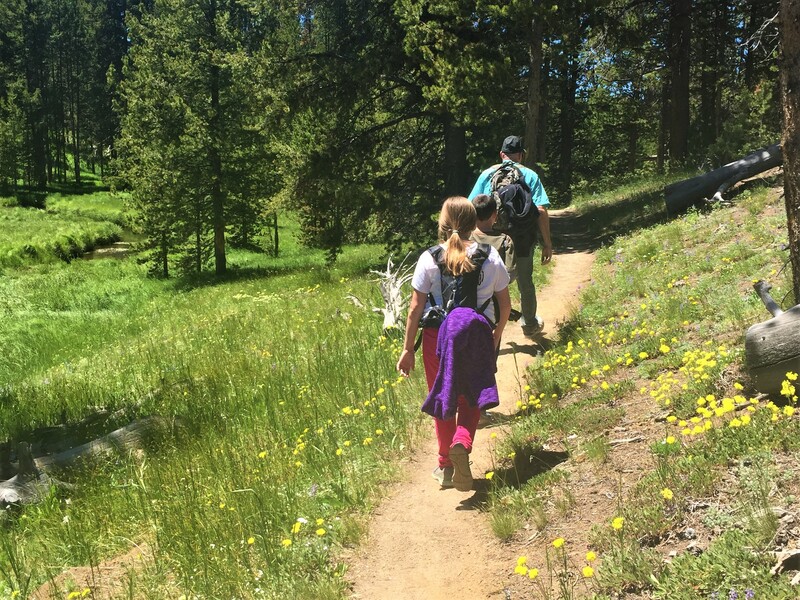 I still laugh as I think about how hard I looked for a bear on that hike and as I think about my daughter singing at the top of her lungs to scare the bears away. Luckily, we were on a less visited trail, because she would have scared other hikers away too! Then there was the moment we arrived back at the trailhead and had not been eaten by a bear! That moment was full of relief and maybe just a little disappointment because we did not see a bear. There are some places you hear about for years and can only dream about seeing. Yellowstone is one of those places. Standing in front of Old Faithful and watching as it erupted was another one of those moments. We had all seen pictures of Old Faithful and had even watched YouTube videos of it erupting, but nothing prepared us for the moment we finally got to see it erupt in person. 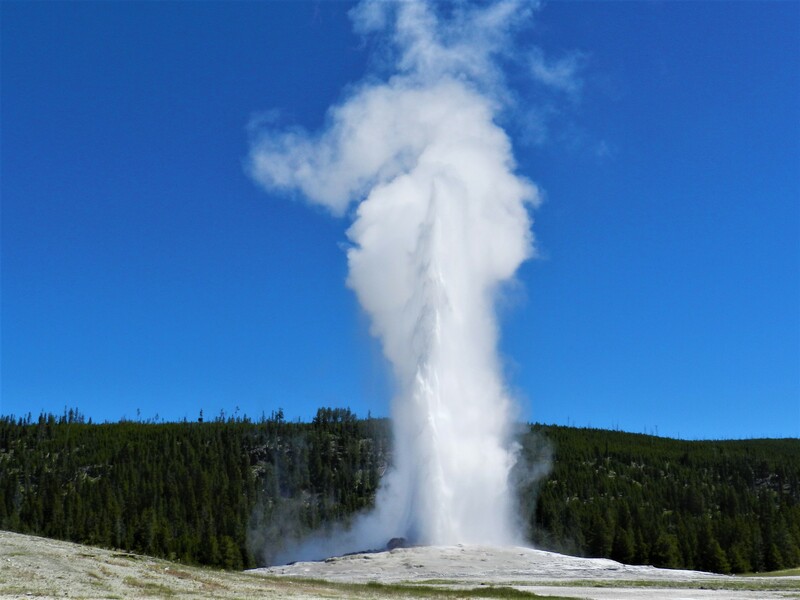 We enjoyed the feeling so much, we watched it erupt 3 times in the day we spent in the Old Faithful area! Several of our “moments” revolved around wildlife. There was that moment we got in a traffic jam because several bison were standing in the road and blocking traffic. Usually when you get stuck in traffic, it is a moment full of stress, but, as we sat in traffic in Grand Teton, I could only giggle and think this is what you always hear about. Then there was the moment we finally saw our first, but not our last, bear and, it was a Grizzly! 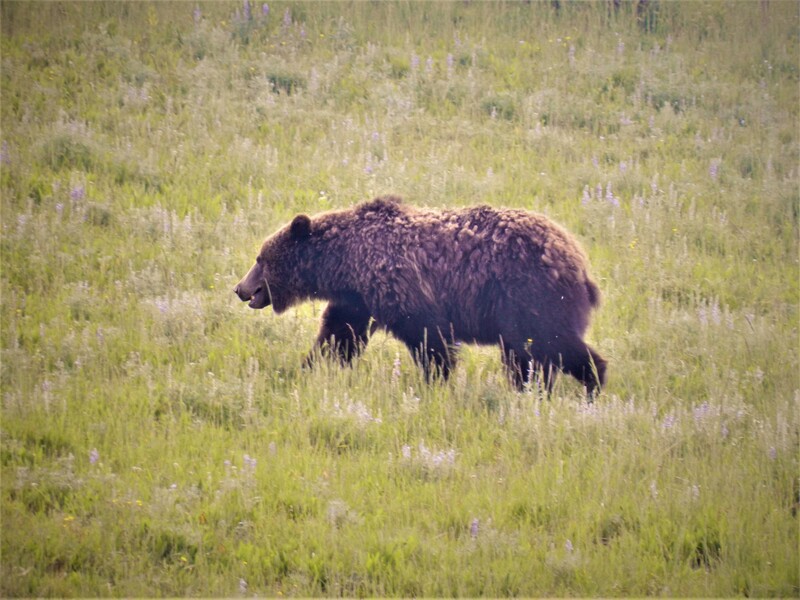 We had looked and looked our entire stay at Grand Teton and Yellowstone, and our last night in Yellowstone, we finally saw one! The crazy thing is we really did not have to look hard, because the traffic jam and 50 people pointing and taking pictures kind of gave it away. Probably my favorite wildlife moment was seeing a Gray Wolf in Yellowstone. My son had done a report on Gray Wolves for school a few months before, and it quickly became his favorite animal. So when we saw a large group of people out of their cars and taking pictures, we just had to stop. When we asked what everyone was looking at and they said a wolf, we all took a look through our binoculars and there it was. In this moment, I watched my son’s excitement and thought this is why we worked so hard this past year to save money to make this happen. Now that we are all full of warm fuzzies, it is important to note that not all “moments” are ones that you really want to happen. 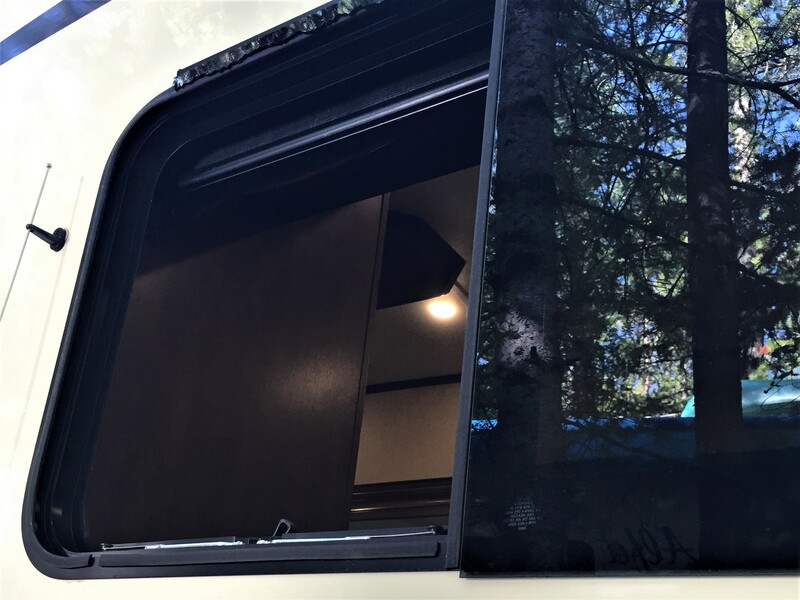 I can still remember sitting in the recliner of our fifth wheel after a long travel day and looking out the window, only to realize there was no glass in the window. Somewhere between West Yellowstone, Montana, and West Glacier, Montana, the glass in our side back window blew out. In that moment, there were thoughts of how the heck are we going to fix this and how much time will it take from exploring Glacier National Park. 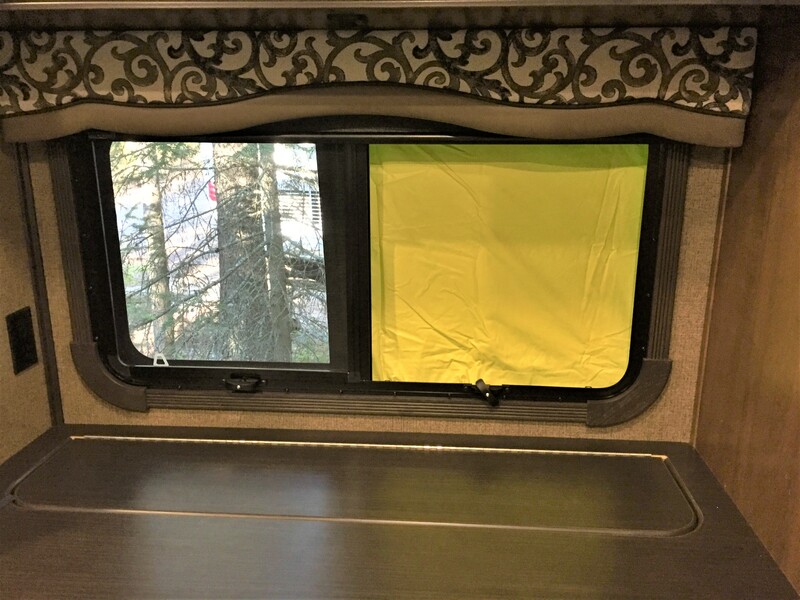 With a little ingenuity, a bright yellow poncho and a lot of duct tape we had the window fixed for the night. 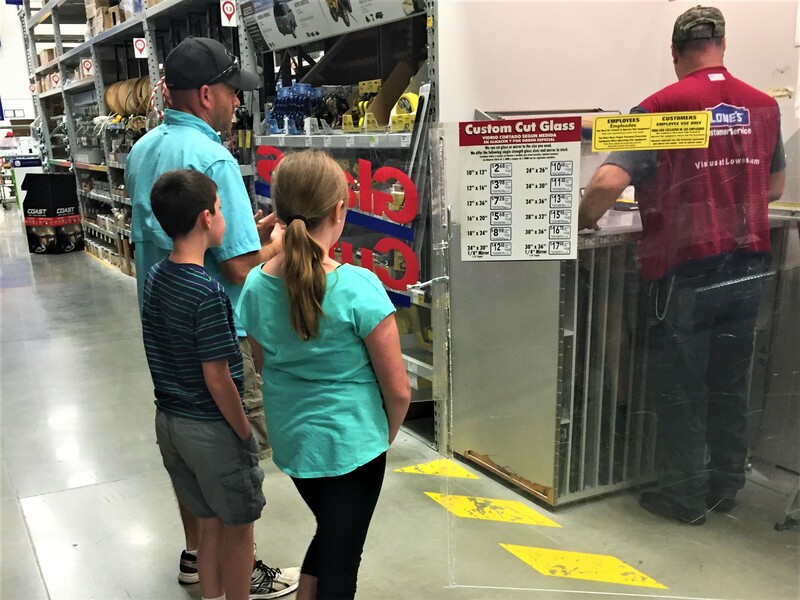 The next day had us standing in Home Depot watching a guy cutting plexiglass, and in that moment, I would have rather been driving down Going to the Sun Road watching goats scale the mountain. Later that morning, the window had a permanent temporary fix, if that makes sense, and we were on our way. Then we got our moment of finally driving through the gates of Glacier National Park, and, in that moment, we felt relief because the window was fixed and excitement about what we would encounter in the park. 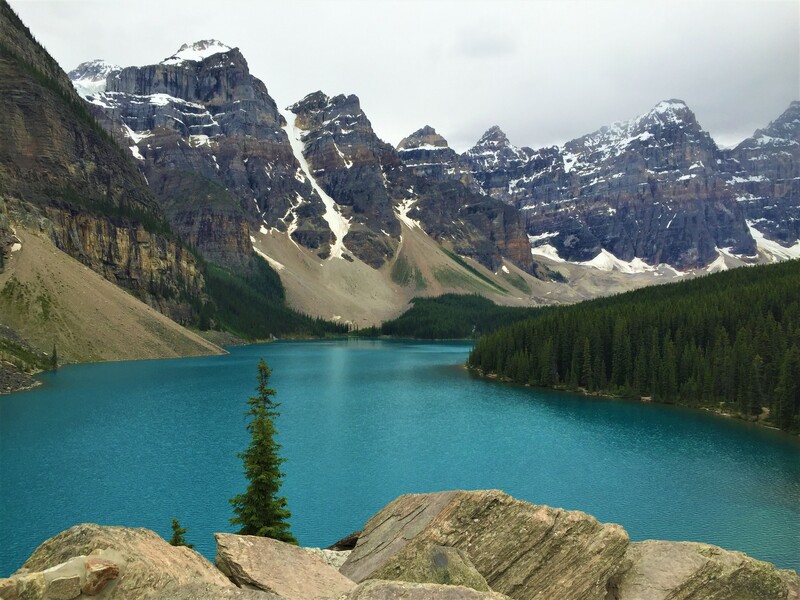 Some of my favorite moments came the day we visited Lake Louise and Moraine Lake in Banff National Park. After standing and being in awe of the beauty of Lake Louise, we decided to take a hike up to the tea house. By this point in our trip, we were all very tired and this hike goes up a mountain. Several times going up the trail, I had moments wondering if this was worth it, but we kept encouraging each other and ignoring the complaining. 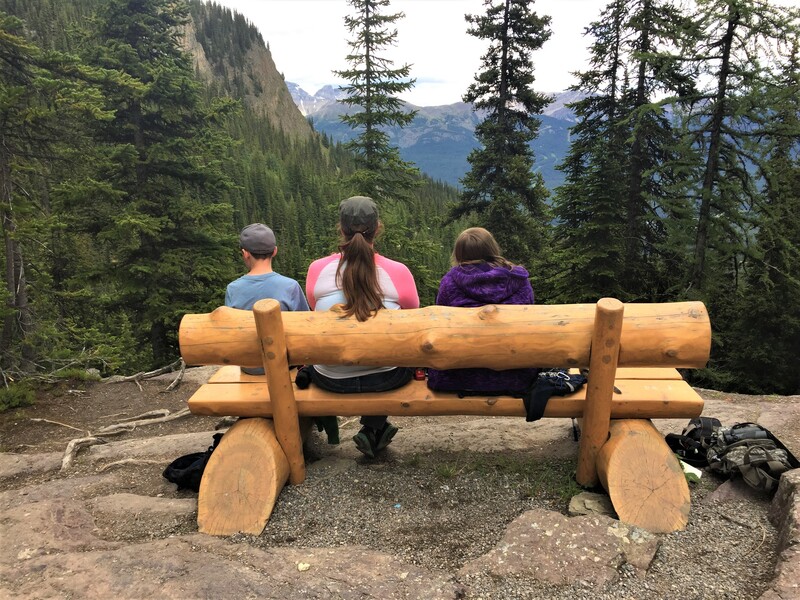 When we finally got to the top, we had a moment of pure happiness that we had finally made it, and when I saw that empty bench with an amazing view, I had a moment of sweet relief! Later that day, we had the amazing experience of visiting Moraine Lake. This is the most stunning place I have ever been. In this moment, I felt in complete awe of God’s handiwork. I have never felt so at peace and humbled as I did standing next to Moraine Lake in the Valley of the 10 peaks. In the past year when I have been stressed, I close my eyes and think about the moments I stood beside Moraine Lake. How do you look back on 5.5 weeks visiting so many amazing places and pick just a few moments to share? Even now, almost a year later, I think of things that happened on our trip that I forgot to tell people. Looking back, I realize that each one of these moments and the countless others I have not shared have changed each of us and have brought us closer as a family. We will be heading out on another extended RV trip in just a few weeks. Although this trip will only be three weeks, I can only pray that we have as many moments to share when we return (and, hopefully, no broken windows!). We look forward to sharing more moments with you and would love you to share your moments by leaving a comment. If you would like to read more about some of the places we visited make sure you read 10 Things Our Family Loved About Yellowstone, A Day In Jackson Hole, Wyoming, A Guide For Visiting Grand Teton National Park, A Guide for Visiting Glacier National Park and A Guide for Visiting Mesa Verde. Watch for posts on Banff National Park, The Icefield’s Parkway and Carlsbad National Park coming soon. 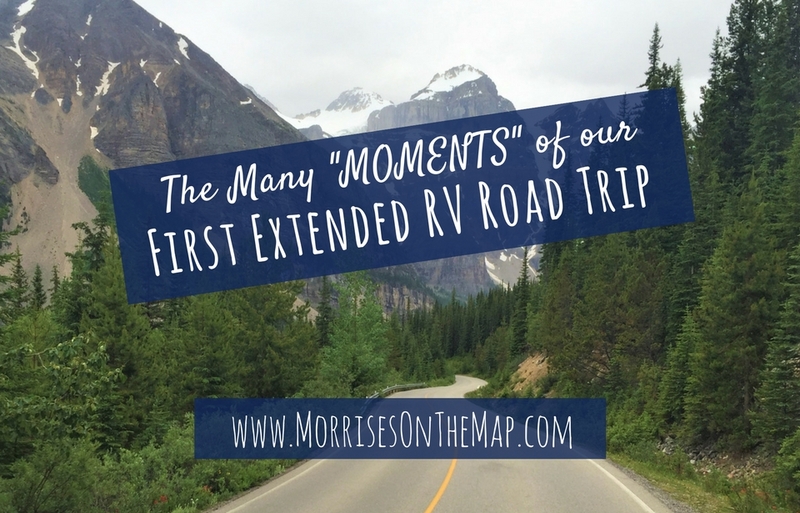 After this trip, we have continued to take long RV trips. Our family loves it!